This fall and harvest themed pumpkin garden ornament has amazing details and a lovely orange color. Measures 18x18.5x1.25", makes your garden outstanding and add instant season decor to it. Made of duarble metal, you can use them again next year and enjoy them for a long time. The decorative pumpkins build in metal stand on the back for easy standing. The decorative pumpkins can be used as an outdoor decoration or placed on mantels, sideboards, shelves indoor to make for an autumn atmosphere. Halloween yard decorations. This cute pumpkin decorations is perfect for decorative displays of Halloween, Fall harvest festival, Thanksgiving. Also a great fall harvest autumn thanksgiving gift and housewarming gift. Pumpkin decor outdoor, measures 18x18.5x1.25", features with hand crafted leaves and curly spirals that brings big harvest charm on your front yard, porch or patio. This cute pumpkin decorations is made of metal, can be used as an autumn harvest or Halloween decoration indoors or outdoors for years to come. 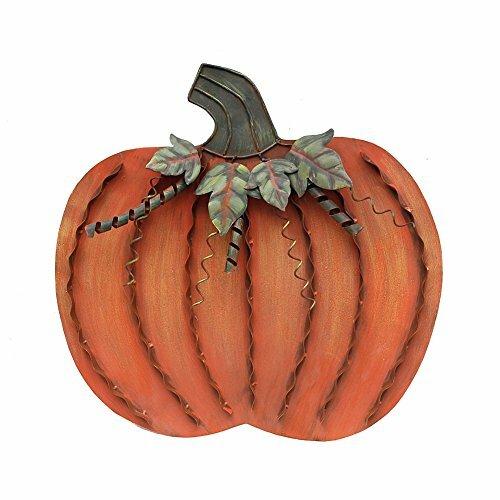 This metal pumpkin decor comes with a build in metal stand on the back for easy standing and provide added stability in strong winds. Perfect for fall harvest decor, Halloween decoration, Thanksgiving decor. With this flat metal pumpkin to celebrate the magic of autumn, outdoor garden decoration to welcome fall season. Satisfation Guarantee: 90-day guarantee for return or replacement this metal pumpkin. If you are not totally happy with the purchase, return it hassle-free for a full refund.